Employees install equipment for the hotline in the White House in August 1963. It is sometimes hard to separate the myth from the reality of the Moscow-Washington hotline, which turned 50 years old on August 30. The hotline is not a telephone that sits in the offices of the two most powerful leaders in the world and can be picked up personally by either for urgent calls. That image comes from movies which, in America at least, have commonly portrayed the hotline as a red phone -- red being the color for emergencies. "Hello, hello, Dmitry. Listen, I can't hear too well. Do you suppose you could turn the music down just a little? That's much better, yes. Fine, I can hear you now Dmitry, clear and plain and coming through fine. I am coming through fine, too, eh? Good. Well then, as you say, we are both coming through fine. Good." But in reality, the hotline always has been something quite different. In America, the hotline is not located in the U.S. president’s office or even in the White House. Instead, it is in the Pentagon, the headquarters of the U.S. military. 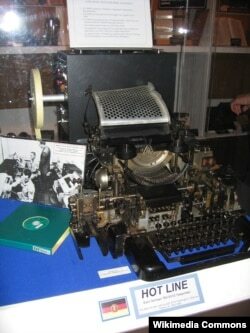 And, when the hotline first became operational on August 30, 1963, it was a telex link through which messages were encoded and typed on one end and decoded and read out at the other. The messages were carried by a 16,000-kilometer undersea cable connection and were rescrambled along the way multiple times to guard against interception by third parties. All the attention to coding and decoding was intended to keep the communications private. But it also was believed to offer leaders a better chance of reaching an understanding than if they spoke directly over the phone during a crisis -- when tempers might get the better of good judgment. At the time the hotline was established, that made particularly good sense. The hotline was created just months after the Cuban missile crisis of October 1962, when the United States and the Soviet Union came to the brink of nuclear conflict. During the five decades of its existence, the hotline has rarely been used. Its first reported use was in 1967 during the Six-Day War between Israel and three Arab states. The connection helped ease tensions between Moscow and Washington over the deployment of their respective fleets during the crisis. The hotline was also used during the Indo-Pakistan war of 1971, the 1973 Arab-Israeli War, and the Soviet Union's 1979 invasion of Afghanistan, among notable examples. Over time, the nature of the hotline -- though not its purpose -- has constantly changed. The advent of satellite communications and information technology has replaced the cumbersome original cable and teletype machines with computer consoles and reduced the transmission time from minutes to seconds. A voice component was added in the 1980s. Is a Moscow-Washington hotline still needed today, long after the end of the Cold War and even the end of the Soviet Union? That question never seems to have come up. Both Moscow and Washington continue to keep the hotline ready to employ. The current system also enables e-mails and private chats, and U.S. President Barack Obama reportedly spoke by phone with Russian President Vladimir Putin as recently as March. That was when Obama phoned Putin to welcome Russian cooperation on international efforts to confront Iran's nuclear ambitions. Still, the hotline most in the news these days is not the Moscow-Washington link but one of the many later ones put in place around the world to follow its example. The "hottest" of hotlines today is the one between South and North Korea. In March, Pyongyang hung up its end of that hotline with a bang heard around the world. North Korea wanted to show its anger over new UN sanctions in the wake of a missile test and regarded cutting the communications link as a good way to underline its threat that "nuclear war may break out right now" if it were pushed too hard. The gesture proved temporary. The two Koreas' hotline was reestablished after a few months of silence -- proving that while crises and even states may come and go, hotlines are here to stay.